Walk into a dental lab or clinic today, and you’ll find a completely different set of tools than you would have just few years ago. Dentistry is well on its way to fully embracing digital workflows, replacing messy alginate impressions with digital scans and complicated manual techniques with computer-aided manufacturing. This should come as no surprise. Every set of teeth is unique, meaning that every dental appliance has to be custom-made. The need for mass customization, and the small size of the final products, makes this a perfect application for 3D printing. While material properties were a barrier to broader application of this technology, new biocompatible materials are enabling dentists to 3D print a growing range of products. To date, Formlabs dental users have completed over 150,000 prints. Today, with the launch of two new Dental Resins, Formlabs is greatly expanding the range of dental products that the Form 2 can produce. With prints every bit as accurate as larger machines that cost $75,000 or more, the Form 2 is increasingly the go-to 3D printer for the dental professionals. Matt Roberts, CDT, talks about his experience running 4 Form 2 3D printers for various applications in his dental lab. Formlabs’ new dental resins add a range of new capabilities to Formlabs printers, including crown and bridge models, splints, retainers, and soon dentures. 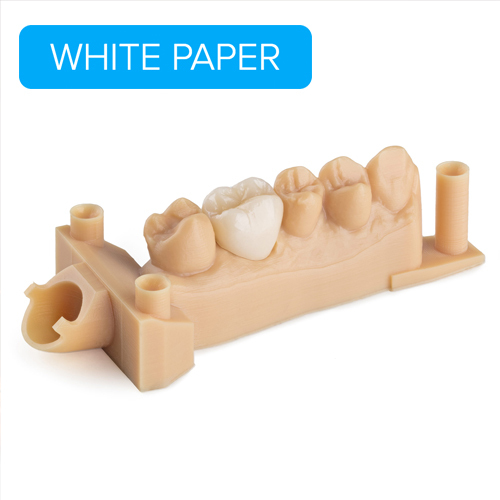 Designed for crown and bridge models with removable dies, Dental Model Resin is a high precision, high accuracy resin. Print crisp margins and contacts within ± 35 microns and removable dies with consistently tight fit. A smooth, matte surface finish and color similar to gypsum make it easy to switch from analog to digital model production. Quad restoration printed with Dental Model Resin. A Class IIa biocompatible resin, Dental LT Clear’s high resistance to fracture and wear make it ideal for splints, retainers, and other direct-printed orthodontic devices. This clear material polishes to high optical transparency for beautiful final products. Splints printed with biocompatible Dental LT Clear Resin. We’re pushing the boundaries of digital dentistry and developing the first integrated, end-to-end workflow for manufacturing high-quality 3D printed dentures. Clinical studies and workflow tests are currently in development at Formlabs and partner dental labs, with the new biocompatible Denture Base and Teeth Resins coming in 2018. Dentures printed with biocompatible Denture Base and Denture Teeth Resin. Formlabs and 3Shape, the global leader in 3D scanning and CAD/CAM software for dental practices and labs, announced a software integration to power complete digital workflows for dental professionals. Initially starting with Implant Studio, the new dental 3D printing workflow streamlines the surgical guide design and manufacturing workflow, making it easier and more affordable than ever to produce surgical guides. Further integrations across 3Shape’s suite of powerful dental software, including Dental System and Orthodontic System, are under development and planned for release throughout the year. Find out more about the 3Shape integration and new features in our announcement. Request a Dental SG sample part, schedule a call with a one of our Product Specialists, or see live demos of Formlabs’ new dental materials and integrated workflow with 3Shape at IDS 2017 (Koelnmesse, Germany, March 21-26): Hall 3.1, stand L70. Workshops are available daily at 10:30 am and 2:30 pm CET.